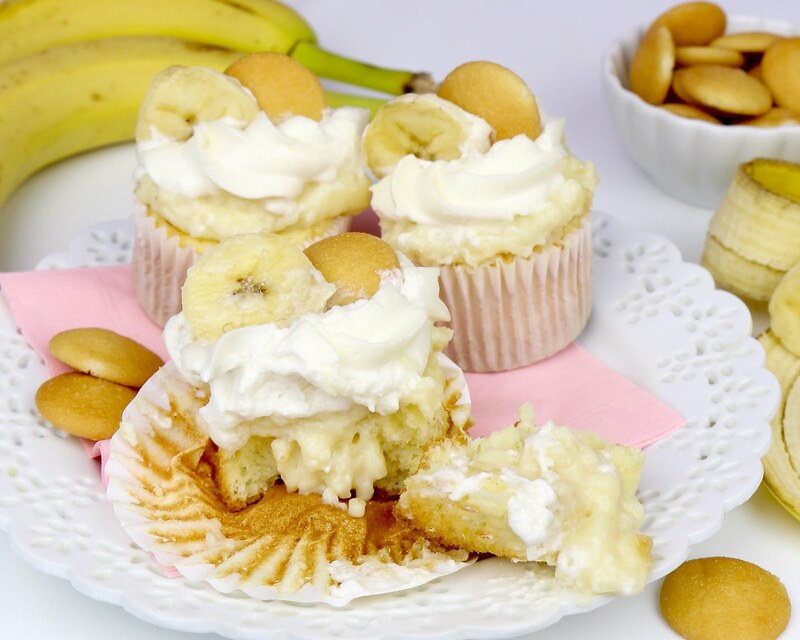 A vanilla wafer cookie and banana slices, layered beneath a fluffy vanilla cupcake, filled with banana pudding and topped with light whipped cream topping. All finished off with a banana slice and vanilla wafer cookie. All of the crunchy, creamy, fluffy, sweet layers that go in to this cupcake, make it such a crowd pleaser. 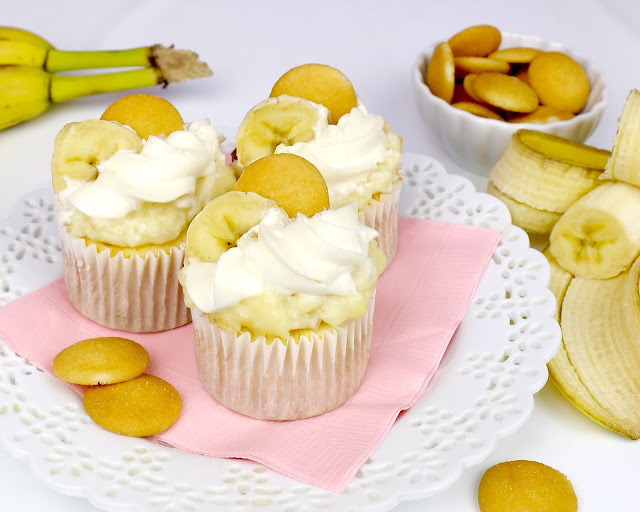 If you love cookies, pudding and anything banana flavored, you are going to love these cupcakes! I decided to share this recipe for Mother's Day for a special reason. 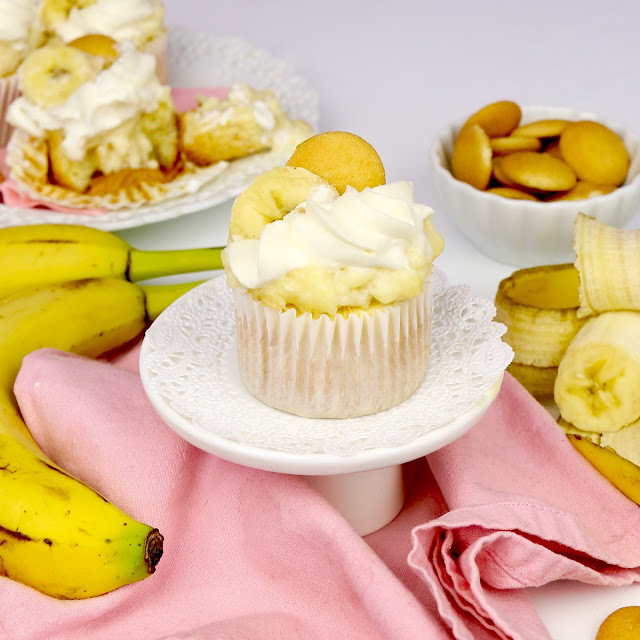 These cupcakes are inspired the Banana Pudding Pie recipe on the Nilla Wafer cookie box... My mom's go-to dessert, and probably the only dessert she knows how to make. With Mother's Day just around the corner, I decided to transform my mom's "famous" banana pudding pie into, what else but... cupcakes! 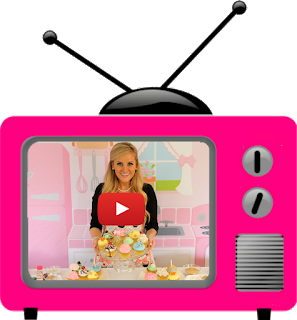 Preheat oven to 350 degrees F. Line a cupcake pan with baking cups. Place 1 vanilla wafer cookie (mini or crushed cookies for mini cupcakes) at the bottom of each baking cup, flat side down. Top each cookie with a few banana slices, saving one banana for garnish. Meanwhile, prepare banana pudding according to direction son package. Let cool. 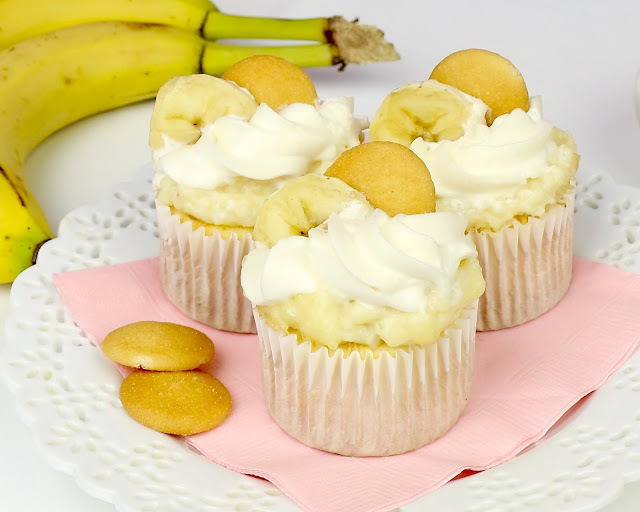 Once cupcakes and pudding have cooled fill cupcakes with vanilla pudding using a filling tip or cut out a cone shaped piece out of the top of the cupcake with a knife or apple corer, spoon pudding into the hole and then place the cupcake piece back on top. For the whipped cream topping, shill metal mixing bowl in the freezer for 5-10 minutes. Using an electric hand mixer, or stand mixer fitted with the whisk attachment, whip all of the ingredients together, starting on low and increasing to high speed, until fluffy, stiff peaks form. Use a pastry bag fitted with a star tip to frost completely cooled cupcakes. . You can also just top your cupcakes with a tub of thawed whipped topping for a quick and simple alternative. Frost just before serving. 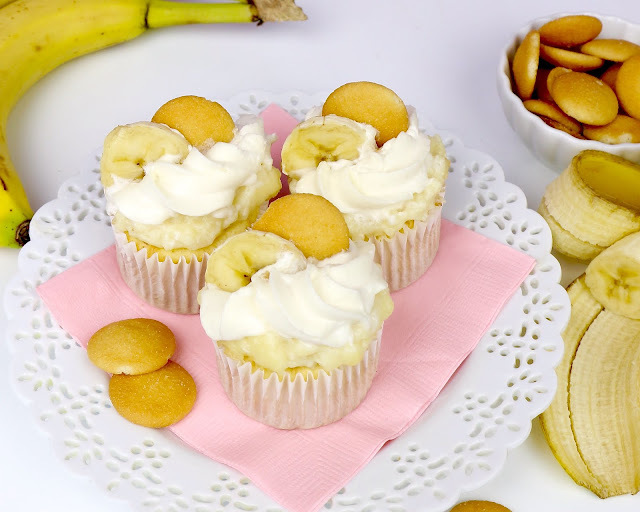 Garnish your cupcakes with a vanilla wafer cookie and a slice of banana (slice banana garnish just before serving to prevent browning).